• Textiles of North India.. • Textiles in West India.. • Textiles in East India..
• Textiles in North-East I.. • Textiles of South India..
Like the culture of India, Indian clothing is also popular for its colorfulness and grace. The majority of Indian women wear traditional costumes. Outfits for women such as the sari bring out the essence of feminism. Mens clothes are suitable for the warm climate and comfort. Men in India can be found in more conventional western clothing. Significantly, each region of India boosts a dress depicting its own culture. The most popular Indian dress is the Saree. 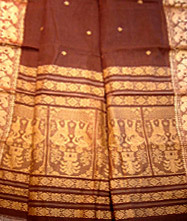 A sari is a rectangular piece of cloth, which is five to six yards in length. The style, color and texture of this cloth varies from cotton, silk to chiffon or any other. Another popular Indian outfit is the Salwar Kameez with a Dupatta worn mostly by women in Punjab and north India. The Sari is one of the oldest forms of womens fashion apparel in India, which still endures one of the most admired forms of clothing in India. The Sari reaches out to all strata of society in India and is the face of India to the world. A Sari is a beautiful draping garment and is worn with a blouse. This seamless piece of clothing is a highly sensual form of clothing because it covers the body and yet subtly brings out the curves of a womans body. A weaver weaves his creativity into the sari, resulting in a huge variety of styles in saris - both designs as well as texture of the cloth. There are a huge number of ways to drape a sari around oneself, limited only by ones imagination. Men generally wear formal clothes in offices like usual pant and shirt and at home they wear Kurta Pyjama. The Kurta or the top is a knee length collarless shirt that is adorned in mostly white or pastel colors. Pyjamas are like loose trousers with a string tied at the waist. Traditionally white in color.